Siiri chose to highlight four types of Finnish weaving because of their long histories. She did not talk about rag rugs, which come to mind to many people who think of Finnish weaving, because they don’t have such a long history. 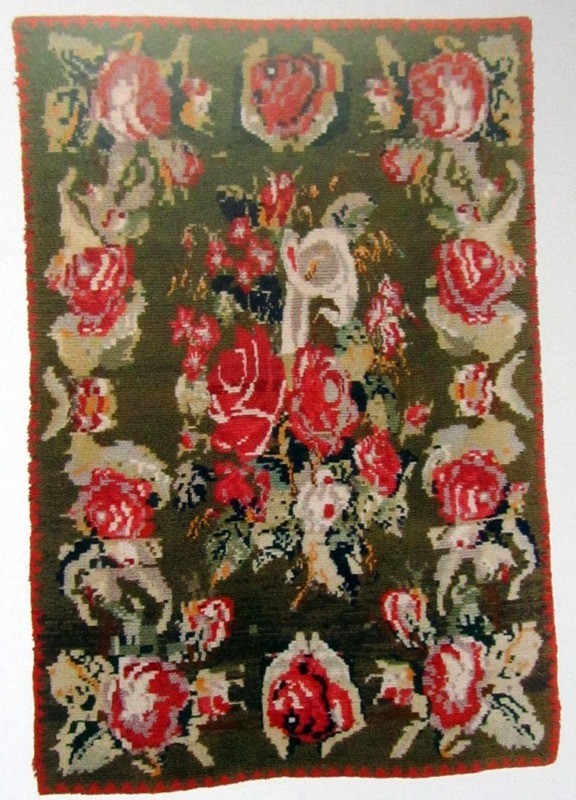 Regular people and peasants have only used carpets on the floor for a hundred years or so, Siiri said. Textiles were most commonly used in the past as bedcovers. The physiological reason for the warmth of a textile is interesting. It’s not the textile that makes you warm, but the air trapped between the textile and the human. 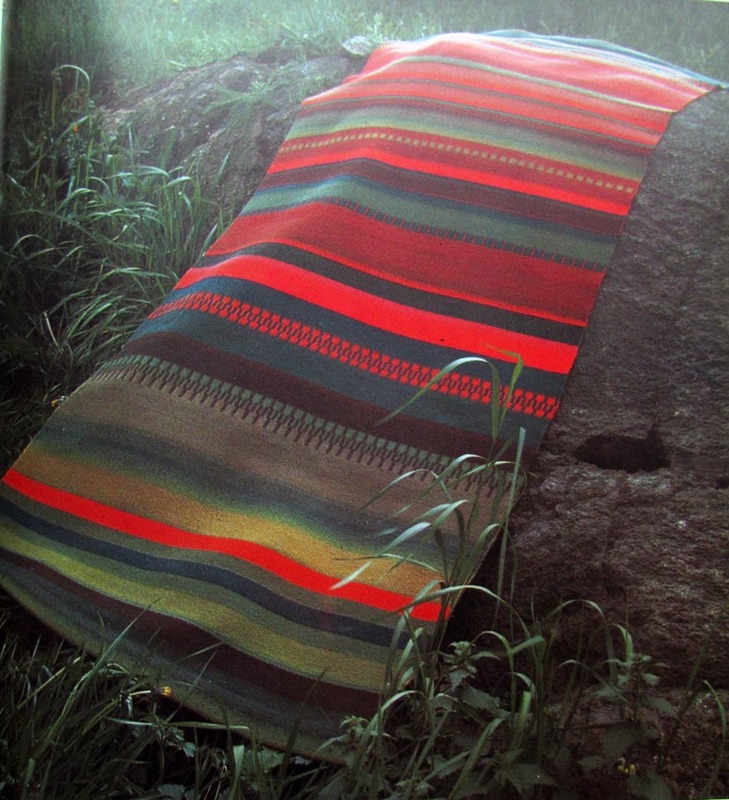 That’s why a ryijy is warm: the pile of the blanket traps air, and the dense ground weave prevents the warm air from escaping. When ryijys were used as blankets, decoration was not needed. Later, decoration was added to the side facing up on bedcovers. Decorated ryijys were used in weddings, often with initials, symbols, and human figures in the imagery. Ryijys used in sleds tended to have elaborate designs at one end, the end hanging out of the sleigh to impress your neighbors. Over time the design of all textiles follows fashion. In the old days, when communication was more limited, patterns were passed down over generations and shared among families. 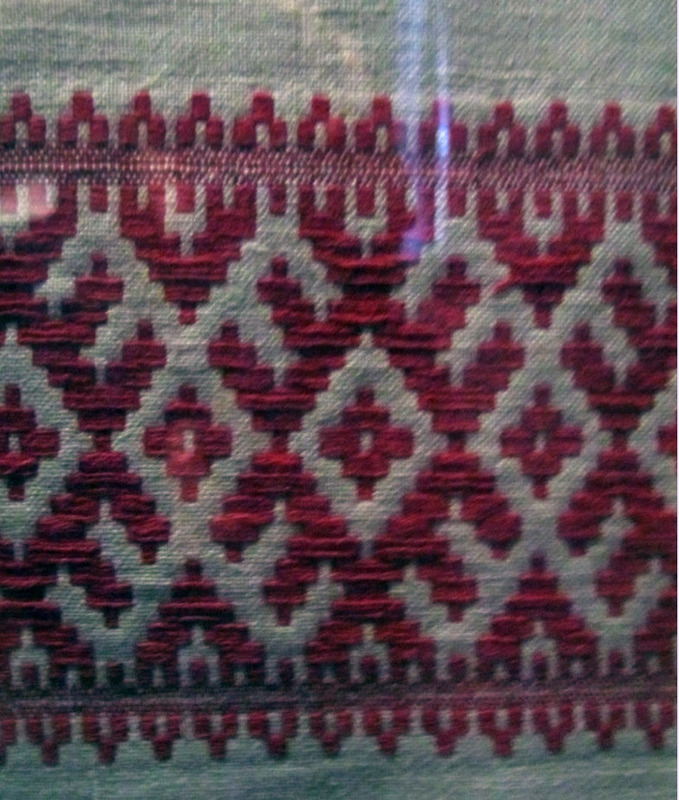 As commerce increased, ryijy patterns showed continental influences; some followed popular cross-stitch patterns, similar to the one shown here. In the twentieth century ryijys became art objects. When Art Nouveau was in vogue, ryijys had sinuous patters. 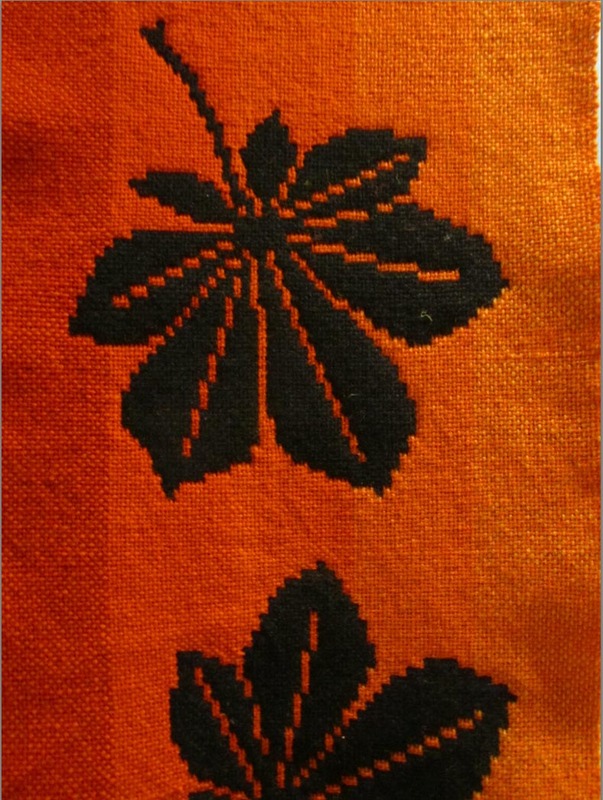 The most famous pattern is likely Aksel Gallen-Kallelaa’s Liekki (‘Flame’). When art became abstract, ryijys became abstract, and most contemporary ryijys are abstract. Ryijys generally use many colors and shades in their pile and have gradual shifts in color. Siiri finds this ryijy, “Penguin,” interesting because the pile emulates drawing. Contemporary artists have used ryijy in new and unusual ways. 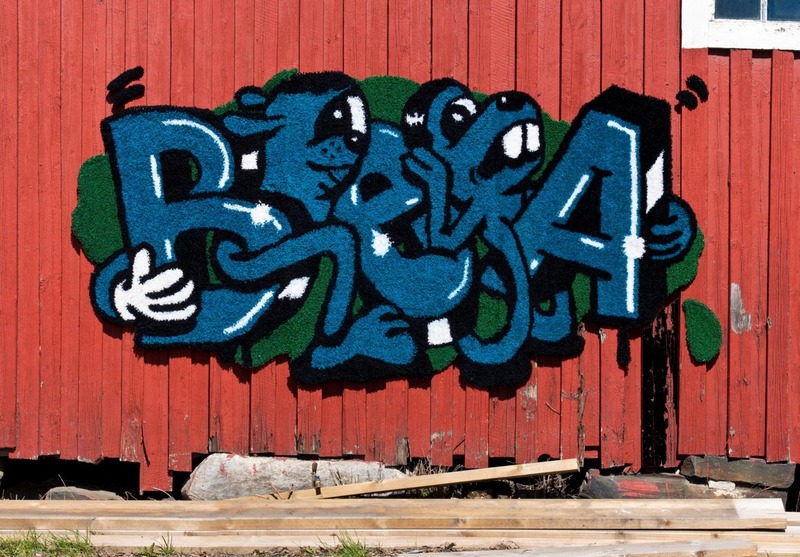 Here’s one by Niina Katinka Mantsinen that looks like graffiti and is not rectangular. 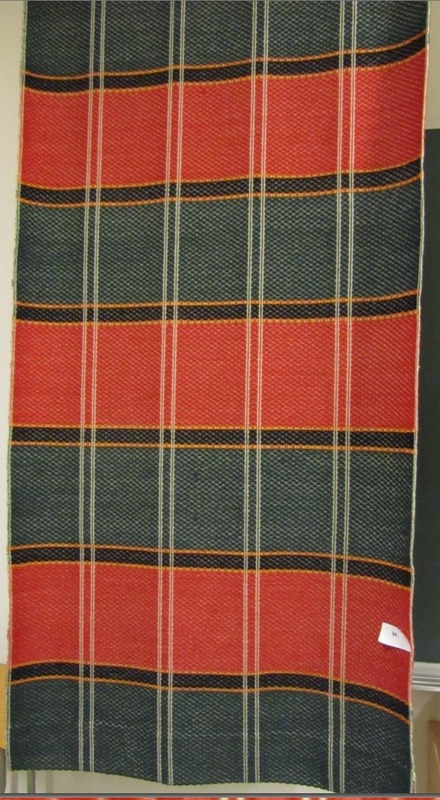 Täkänä, or doubleweave, is a traditional Finnish textile, generally woven of wool. 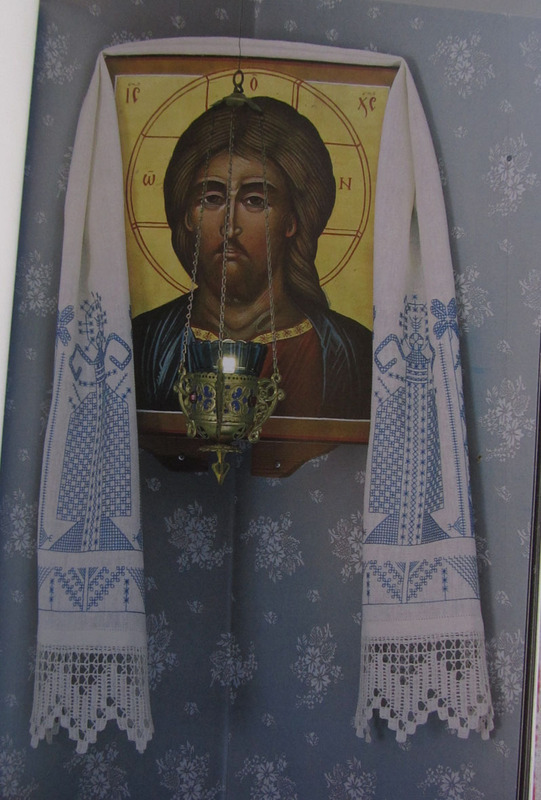 The fabric is quite soft, and drapes better than many of the traditional textiles. The fabric is woven by alternately bringing up one set of threads or the opposite layer of threads. Patterns can be graphed out exactly, or a rough outline can be followed; it’s a slow weaving process. Most Täkänä pieces are woven with two colors, although Siiri feels there are many opportunities to work creatively by using several colors in the warp or weft, or perhaps varying the weave structure to a twill rather than plain weave. Täkänä designs have changed over the years, following fashion. The technique was was popular in the 1970s, but there are not many artists using it now. At the adult education center where Siiri studies, weaving students take classes for at least five years before they are allowed to weave täkänä . 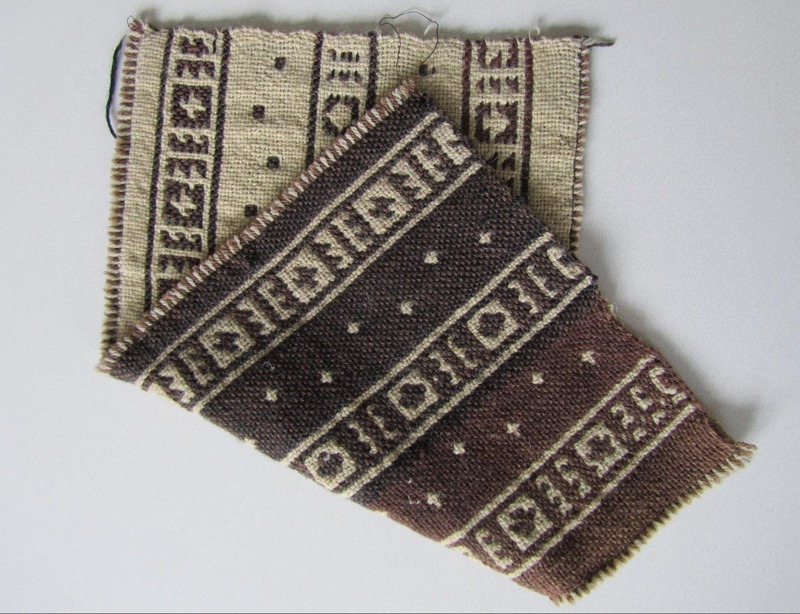 Raanu is a term for a group of weaving techniques, generally weft-faced, that were traditionally used as coverlets. They are usually tightly woven and quite stiff. The patterns vary widely. 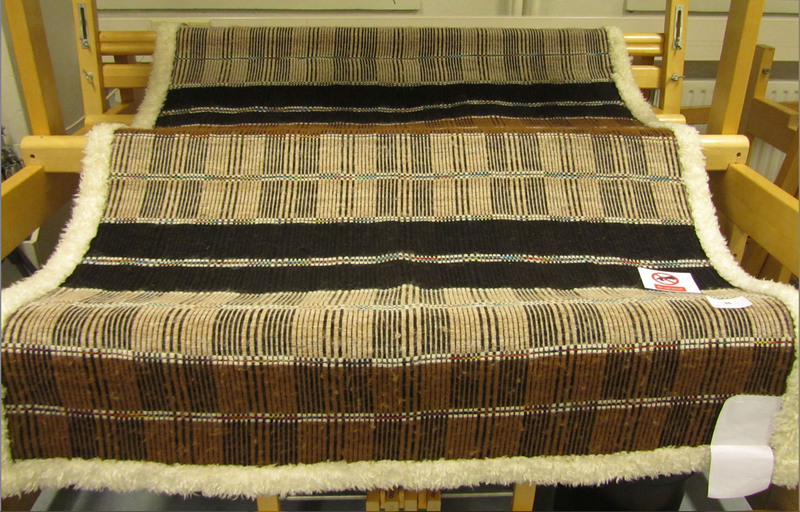 The warp was traditionally linen, although these days Finnish weavers usually use cotton. 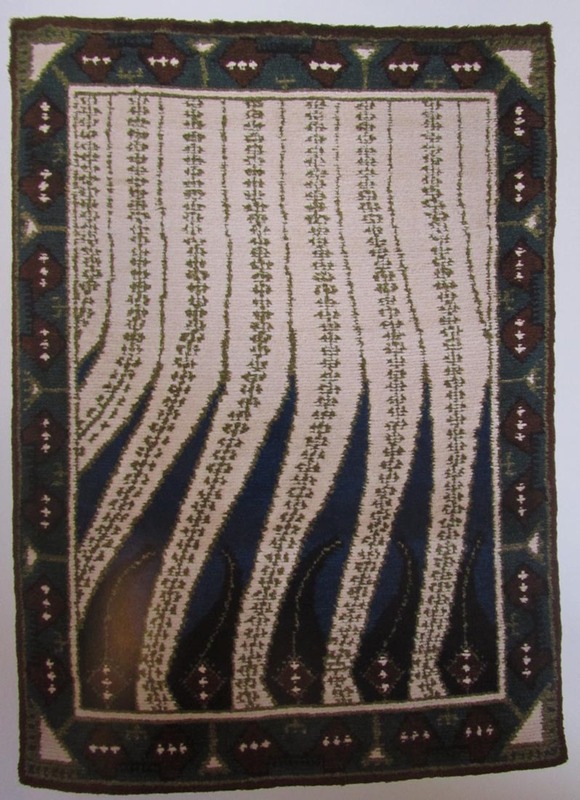 Raanus were used as blankets, but after the modern duvet came into use, they are generally used as sofa throws and wall hangings. The weaving is slow because you have to beat the weft in order to cover the warp. There are many patterns that can be considered raanu. Below are some raanu examples that Siiri showed. Käspaikka are wide, long white towels (usually about 2-3 meters), woven in plain weave with designs in both ends, and generally bordered with lace. They were used to dry your hands, as napkins, and used in ritual functions such as weddings and funerals. For example, the bridesmaids tied them around their waists during a wedding. They were often draped on religious icon paintings. Käspaikka were made by girls before they were married. They had to produce enough käspaikka towels before their weddings, because married women did not make them. The designs, usually in red, were either woven in or embroidered afterwards. Designs often included ancient symbols or animals, birds, peacocks, plants, tree of life, horsemen, or humans. The embroidery, which Siiri called front-stitch embroidery, looks the same on both sides. 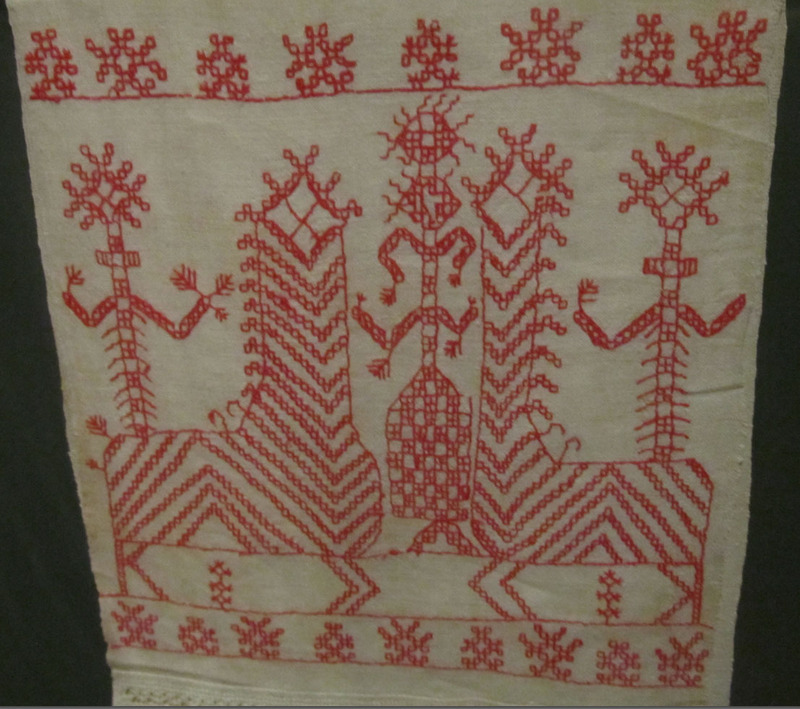 Käspaikka are sometimes printed (which is often done in Russia), made with drawn-thread techniques, or in a woven technique called red-picking. Weaving käspaikka is no longer a living tradition, although there are some weavers who reconstruct old pieces. 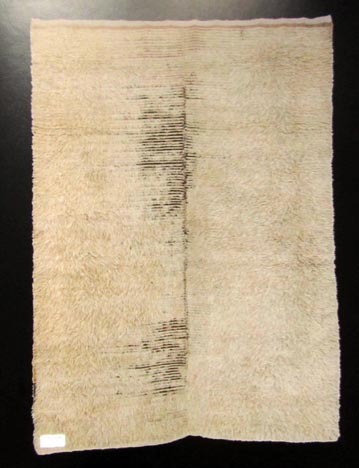 Weaving towels in general remains popular, made either in linen or a cotton/linen blend. Waffle weave is popular. Computer-assisted looms are becoming popular, and most classrooms have one. 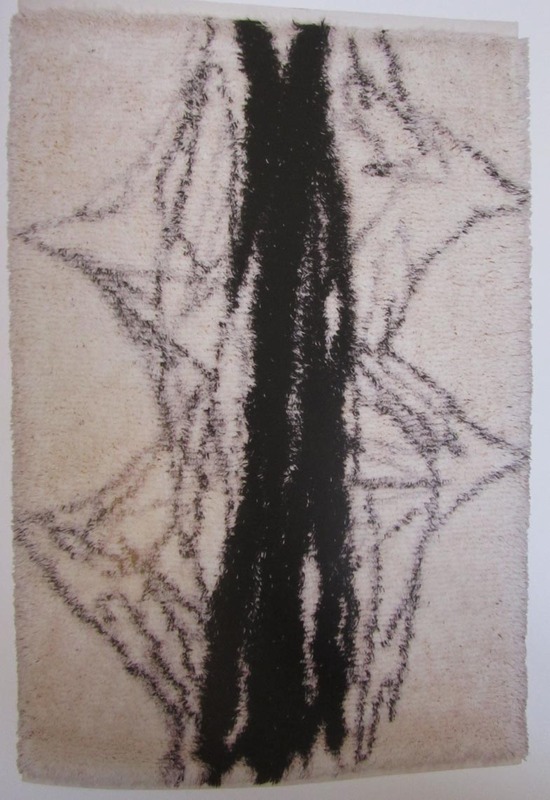 Weavers spend hours developing new patterns, often with images of objects or photos meaningful to them. They share patterns; a recent popular pattern was a monster rabbit. Perhaps the new towel traditions have links to the old ones, Siiri commented. Instead of sharing embroidery patterns among family and community members, as in generations past, friends can now download patterns for a computer-assisted loom on their flash drives. The creative impulse lives on.